Welcome to the Nation! If you are new and you like what you read, I hope you'll subscribe! If you are a blogger, you know about blog conferences. 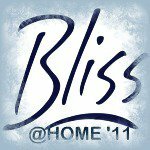 If you know about blog conferences, you know that Blissdom’11 is at the end of this month. In August, I learned about Blissdom. I was determined to go. Yes. This would be my first blogging conference. Except that it’s not. I’m not going. I thought I was Ok with not going, but then facebook and twitter started blowing up with lots of blissdom talk and roommate pairings and what to pack and…well? I got all jealous. It’s true. So a few of us who were NOT going start tweeting about how great it would be to get together for wine and pedicures. Except that we live ALL. OVER. THE. COUNTRY (and Canada). That lead us to talking about doing local blogger get togethers on one day and tweeting/blogging about it. But then we thought it would be fun to each write a post that was sort of about blogging and how to be better at it. And it just snowballed and snowballed and…ZOMG! Bliss at Home was born! And holy cow did you guys make it BIG…FAST! So far we have over 120 “fans” on facebook who think it would be fun to check out. (by the way, for now? facebook is the best place to get updates. So go “like” us there). We thought it would be good to have a place where we could post sort of a schedule for you though, hence this post. We are all very different in our blogging. We have all been doing this for different lengths of time. We all have something unique to share. Sluiter Nation: Inside the Blogger’s Studio: A new blogger and a seasoned blogger discuss blogging. Move over Mary Poppins: NOT Marketing Your Blog…and Why That is Ok Too. Sluiter Nation: SWAG, baby! NINE giveaways to thank YOU for participating! Peace, Love, and Museli: Turn Off The Computer: Go outside, read a book, get inspired! The Best of Bliss at Home! We will all be choosing our favorite posts by YOU to link to on our blogs! Sluiter Nation will announce the swag winners. *In addition to the “hostess” bloggers, there will be other bloggers doing posts on these topics as well that we will be linking to, so stay tuned! **this is a preliminary schedule. Things are subject to change or switch around. There you have it! You know you want to join in, yes? YES!! Do you have questions? Suggestions? Worries? Excitement? Share with us! Ok, so the title of this says there is also an announcement. There is. Something I am over the moon excited about. Something that has me so honored I am still sort of in shock. It’s so wonderful…you are just going to have to go HERE to find out. Bliss at Home. The Red Dress Club. I am one happy, blessed girl. Can’t wait for all of you to join in on BOTH! Just a small town girl...wait no. That is a Journey song. Katie Sluiter is a small town girl, but she is far from living in a lonely world. She is a middle school English teacher, writer, mother, and wife. Life has thrown her a fair share of challenges, but her belief is that writing through them makes her stronger. Yay! So excited! Can’t wait! Very cool. But I also think a Michigan blogger meet up would be cool too!! YES! It’s in HOLLAND! That is where I live! We SOOOO should all go!!! Congrats on TRDC! I just started reading that blog, and it sounds like a great network and community. You seem like a perfect fit! Love this idea! I too was getting jealous! I just joined the FB page. I’m really looking forward to yall’s posts & I’d love to meet &/or get together with other NC bloggers. I can’t wait! It looks like it’s going to be a lot of fun! I so wanted to go to Blissdom in Toronto (practically my back yard!!) but it didn’t work out. I’ve never been to a blogging conference but would love to go. Swag is fun but I have so much to learn and that would be my real motivation. A blogging conference in my Pj’s at home? Sounds delightful!